This quote appeared in the 1000th issue of the Socialist. It is from Dee Millhouse and Alison Beaumont, health workers from Chatsworth ward, Mansfield community hospital, where there was a successful campaign to keep the ward open. As Dee and Alison say, this is a paper written by ordinary people - people involved in campaigning to defend the NHS, fighting tuition fees or striking to defend jobs, pay and services. "There's this new media mantra 'your readers know more than you do'. Somebody who works in a school or hospital is likely to know more than a journalist - why could they therefore not be used as a resource." But unlike the Guardian, the Socialist Party has always recognised the vital importance of workers, community campaigners and young people writing for our paper. And unlike the Guardian, our starting point is that it is collective struggle by working-class people which holds the key to changing society and transforming the world. 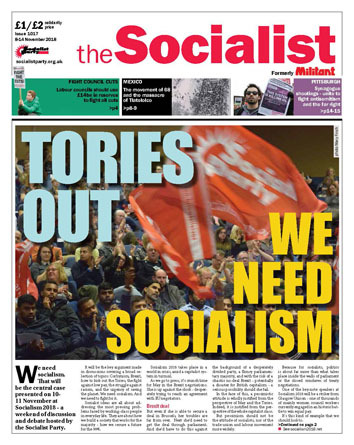 Each week the Socialist gives a socialist analysis of events, helping to clear away the lies, distortion and deliberate confusion put forward in the capitalist media. 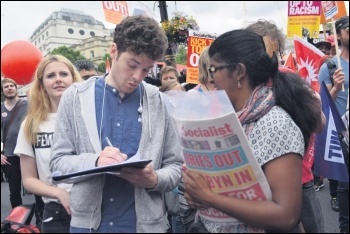 Whether it's putting a bold socialist alternative to the crisis of Brexit, building a movement to challenge the far right, or the strategy that Jeremy Corbyn needs to adopt to defeat the Blairites, the Socialist provides answers in a clear fashion. Mears housing workers in Manchester are another group who recognise the importance of the Socialist. "If you have to take strike action for 87 days then know this: help is out there. Our friends from the Socialist Party and the Socialist newspaper stood shoulder to shoulder with us throughout six months. Never failing to offer support on protests, demos, leafletting, [and with articles] online and in print, to raise awareness of our cause." But it is vital that we have the resources to continue to fund the production of the Socialist. Mears workers recently took out a subscription to the Socialist. This provides an excellent example of what you need to do. Follow their example by subscribing to the Socialist today!